At the MPC's November and October meetings, there was a three-way split among its nine members. The most recent figures showed that Consumer Prices Index (CPI) inflation rose to 3.2% in October, well above the target rate of 2%. This comes ahead of VAT rising to 20% from 17.5% on 4 January, and the possible negative economic impact of the government's spending cuts. Since June, MPC member Andrew Sentance has been voting in favour of raising interest rates from 0.5% to 0.75%. Meanwhile, at the MPC's meetings in October and November, Adam Posen voted in favour of £50bn of extra QE. 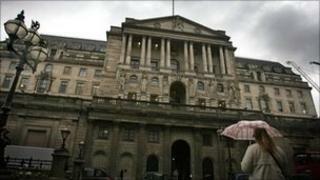 QE involves the Bank putting fresh money into the financial system in an attempt to stimulate the economy. The British Chambers of Commerce said interest rates should remain on hold into 2011 to help the economic recovery, and that the Bank should consider restarting the QE programme. David Kern, chief economist at the British Chambers of Commerce, said: "Despite positive economic news recently, risks of a setback will inevitably increase in the first half of 2011. "While we support the painful fiscal measures needed to stabilise Britain's public finances, every effort must be made to minimise the danger of a downturn." Recent official UK economic data showed that manufacturing output grew by 0.6% in October, the fastest pace since March. Meanwhile, the overall UK economy grew by 0.8% between July and September.